The spiritual life starts with questioning - Elizabeth L. Angeli, Ph.D.Elizabeth L. Angeli, Ph.D.
← What is a spiritual academic life? My spiritual mentor, Sr. Arlene, shared those words with me over 10 years ago. At the time, I understood it to mean “faith starts with your questions”: Who or what is God? What Church doctrine do I accept and reject? Why? Do I need a religious structure to help me connect with the divine? As the years have gone by, I continue to ask questions as a way to understand and develop my spirituality. 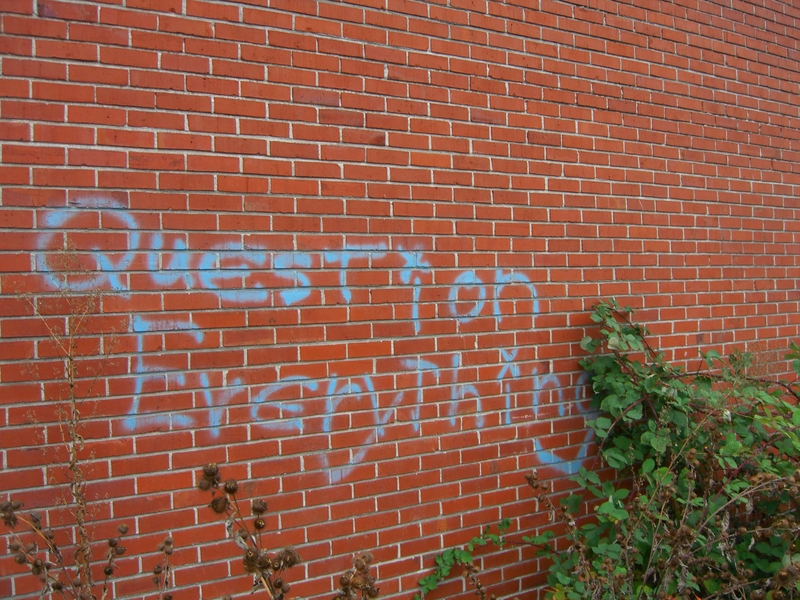 After all, questioning is one of the things that academics do best. So, in many ways, the academic life aligns with the spiritual life and vice versa. As academics, we are prepared to engage in the spiritual life. It can lead to a spiritual academic life. By questioning ourselves and having others question us, our faith and spirituality deepen. They become richer if we’re open to the challenges inherent in this work. When I moved to my doctoral program 10 years ago, I expected people to be open, inclusive, and accepting of all backgrounds and contexts. In many ways, I experienced this openness—except when it came to my spirituality and faith. I learned that I had to be careful with whom I shared my spirituality. On one of my first nights in town, I went out to a bar with my new graduate school colleagues. These colleagues were ahead of me in the program, and I looked forward to getting to know people who I’d be learning with and from. The conversation unfolded, and I mentioned that I was a progressive Catholic, thinking nothing of it. After all, it was a part of who I was. People laughed, and the conversation shifted. But I was silenced. I didn’t know what to say. I felt out of place. I felt exposed. I felt shamed and ashamed for being who I was. At that moment, I unconsciously closed off the faith and religious parts of my life. I can only now see this moment as the first time I entered the dark night of the soul, a time when my spiritual life did not make sense. Like I do when I have spiritual crises, I called Sr. Arlene. I was mad. As the years went on, I grew furious at the contradictions I noticed developing around me. This same group of people that asked if I was smart enough to be atheist and laughed in response were open and inclusive in our graduate classes together. They engaged in feminist and participatory research methodologies, epistemologies, and pedagogies. I learned a lot from them about how to be an engaged researcher and an active learner. Yet they shut me down within the first 20 minutes of meeting me. I struggled to understand why. I never discussed it publicly (until now). I feared, and in some ways still fear, being reprimanded, shamed, or made fun of for something that was and is deeply important to me. This frustration fueled my spiritual development throughout my doctoral program. I committed to speaking with Sr. Arlene over the phone on a regular basis. She helped me develop a centering meditation practice. Through this practice, I felt led to become an associate of the School Sisters of St. Francis, the progressive group of women religious that ran the schools my brother and I attended. As I worked with Sr. Arlene, I quietly searched for a Catholic church in the conservative small town where I was new. “Pro-life” banners adorned the Catholic churches down the street from my new apartment, and my qualms with the Church arose: “How can you judge people before they even enter your space?” Needless to say, I didn’t find a Catholic church that fit my emerging spiritual development, which was taking me away from religion and more towards a spiritual life. So, I continued to work with Sr. Arlene and shared my spiritual struggles with trusted friends in my cohort and a few professors. I finally found a (non-Catholic) church community where I felt accepted. A few of the faculty members were members there, too. I felt home. I felt seen. Yes, spirituality begins—and continues—with questioning. But as my graduate school colleague showed me, it doesn’t only begin with the questions we ask ourselves. It begins and grows with the questions other people and events ask of us, too. What questions arise for you when you think about your faith, religion, and/or spirituality? What questions have been major turning points in your faith, religious, and/or spiritual life? Where, when, and with whom do you find spiritual nourishment? What does “spiritual nourishment” mean to you? Who has questioned you in the past regarding your faith, religion, and/or spirituality? What emotions arise when you think of this person/these people? How might have these emotions and people helped you deepen your faith, religion, and/or spirituality? This entry was posted in Uncategorized and tagged dark night of the soul, graduate school, spiritual direction, spiritual mentorship. Bookmark the permalink.